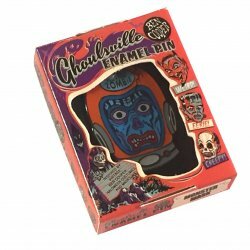 Ghoulsville Deep Space Astro Zombie Vintage Ben Cooper Style Horror Mask Enamel Pin! Looks just like the Halloween masks of years past - just smaller! You're light years from home and lost in space on a desolate planet. Well, at least you have your best buddy to keep you company. At least you did ... until he became ... a Deep Space Astro Zombie! Fun orange Collector's Edition Box has purple, black and pale blue ghostly design. Measures just over 2" high and 1.5" wide and .25" deep in all its spooky-ness. The lid with the clear cellophane peek-a-boo window comes off and on just like it should. Pretty perfect. . COLLECT THEM ALL! Also see our selection of huge (nearly two feet tall!) vintage mask horror wall decor!